From Dave Langford, 94 London Road, Reading, Berkshire, RG1 5AU. ISSN 0265-9816. E-mail ansible[at]cix.co.uk. Fax 0705 080 1534. Logo: Dan Steffan. Cartoon: Sue Mason. Available for SAE, margil, orakh, simple swizzle, Martian vuzd, or zith. ACCA. It was that time of year again: the Arthur C. Clarke Award was presented on 18 May at the London Science Museum, with copious free wine before and after. Five of the six nominees (Connie Willis couldn't make it) trembled in the front row of the Imax theatre as administrator Paul Kincaid worked up suspense via such delaying devices as a special presentation to Sir Arthur's brother Fred, for his hero work behind the scenes. Then last year's winner China Miéville – togged up, for the first time in living memory, with a suit and tie – opened the fatal envelope as quickly as he could, and presented the souvenir bookend and £2002 cheque to Gwyneth Jones for her 'near future fantasy' Bold as Love. Gwyneth later recollected in tranquillity: 'The operation was really very painless. Neither fear nor hope possessed me. I didn't have a thought in my head when China stood up, besides well, now we can all clap the winner, stand around nattering for a bit and then go home....' She had been repeatedly shortlisted for previous Clarke Awards; her editor at Gollancz, Jo Fletcher, said 'Fifth time is the charm!' Despite widespread concern that the Imax screen might at any instant light up with a terrifying seventy-foot talking head of Sir Arthur, it wasn't used. 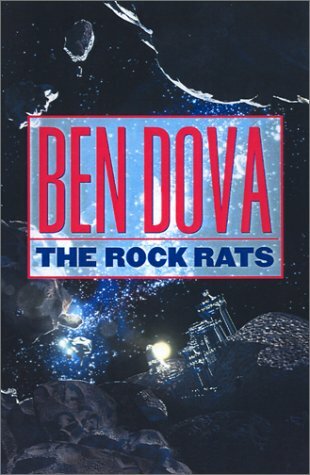 Ben Bova's sf novel The Rock Rats was illustrated on Amazon.com – for a short glorious period in April and May, until the authorities noticed – with a cover scan which subtly modified his name to BEN DOVA. 17 Jun [postponed from the originally announced 10 Jun]  Reading at Borders, Oxford St, London. Pat Cadigan and guests TBA. 6:30pm. 'You dog.' Borders staff tend to deny all knowledge of these events when phoned; the May reading nevertheless happened. 17-23 Jun  Writing on the Wall festival, Liverpool. 17th: Andy Sawyer's 'SF: the new commonwealth' panel, with Steve Aylett, Gwyneth Jones and others; The Picket, Hardman St, 7-9pm, £3/£2 conc. 19th: Ramsey Campbell speaks at Unity Theatre, Hope Place, 5:30-7pm. 21-3 Jun  SFX Event (hugely media-oriented), Norbreck Castle Hotel, Blackpool. £75 reg! Several actor guests (but definitely not J. Michael Straczynski: 'he hates us he does,' said my SFX contact), plus 'the SFX Team'. When regular columnists ask if they're part of this team, a great silence falls – quite a relief, really. Tickets from 01225 788215. 26 Jun  BSFA Open Meeting, Rising Sun, Cloth Fair, London, EC1. 7pm on, fans present from 5pm. Guest speaker: no word as yet. 1-7 Jul  Eurocon 2002, Chotebor, Czech Republic. $20/$25 reg (it says here; these are US dollars). Contact avalcon@avalcon.cz. 9-11 Aug  ConteXXt (Unicon 20), University of Gloucestershire. Joint event with HarmUni 2 (filk relaxacon). £30 reg, £15 concessions, small children £1. Contact 17 Cow Lane, Didcot, Oxon, OX11 7SZ. 16-19 Aug  2002: A Discworld Odyssey (DWcon 3), Hanover International Hotel, Hinckley, Leics. Usual guests. Reduced rates since 1 April: £45 reg, £30 concessions, £10 supp – reverting to £50/£35/£15 at end July. Contact (SAE) 23 Medora Rd, Romford, Essex, RM7 7EP. 17-18 Aug  Caption (small-press comics), Oxford Union, St Michael's St, Oxford. £9 reg (£6 students/unwaged), £12 at door. Contact 18 Hawkins St, Oxford, OX4 1YD. 29 Aug - 2 Sep  ConJosé (60th Worldcon), San José, California. Still $180/£125 reg until advance booking closes on 31 July; $200 at the door ($180 on Sat 31 Aug). Contact PO Box 61363, Sunnyvale, CA 94088-1363, USA; UK agents 52 Westbourne Tce, Reading, RG30 2RP. 21 Sep  FantasyCon, Champagne Charlie's, 17 The Arches, Villiers St, London, WC2N 4NN. 10am-6pm, winding down to pub evening. Guests TBA. £17 reg, £12 for British Fantasy Soc members; £20 at the door. Contact Beech House, Chapel Lane, Moulton, Cheshire, CW9 8PQ. Awards. Carnegie Medal for children's fiction: the current shortlist of 8 includes two fantasies by well-known names, Peter Dickinson's The Ropemaker and Terry Pratchett's The Amazing Maurice and His Educated Rodents.  Lambda Awards for gay/lesbian/etc writing: the 2002 sf and fantasy category was won by Lisa A. Barnett & Melissa Scott, for Point of Dreams.  Sidewise (alternate history) shortlists ... LONG J. Gregory Keyes, 'Age of Unreason' series – Newton's Cannon, A Calculus of Angels, Empire of Unreason, The Shadows of God; Allen M. Steele, Chronospace; J.N. Stroyar, The Children's War. SHORT Stephen Baxter & Simon Bradshaw, 'First to the Moon'; Ken MacLeod, 'The Human Front'. [SHS]  Nebula footnote: Tim Powers's Declare was removed from this year's final ballot owing to a limited edition published in 2000. Group Gropes. London: cries of horror resounded in May as the Florence Nightingale, current home of various London fan meetings including the traditional first-Thursday-each-month evening gathering, stopped serving meals after 5:30pm. Greasy, inadequate 'bar snacks' such as potato wedges remain available for the truly desperate.  Ex-landlord Kevin confides that 'his spy told him that takings at the Dead Nurse are down by over 2,000 quid a week since he left. Fan groups and darts groups are all leaving.' [RN]  Leytonstone: new sf pub meeting launched. 7pm at The Walnut Tree, 857-61 Leytonstone High Rd, on the Tuesday after the first Thursday each month, e.g. 11 June. R.I.P. John Nathan-Turner (1948-2002), BBC producer responsible for 130 episodes of Doctor Who from 1980 to 1989, died on 3 May aged 54. He first joined the show as a floor assistant in 1969. [JW]  Bill Peet (1915-2002), who scripted the animated 101 Dalmatians and The Sword in the Stone, and contributed to many other Disney classics, died on 5 May at age 87. He also wrote 35 children's books, several of them award-winners. [PB]  Bruce Pelz (1936-2002), US fan who was a mainstay of the Los Angeles SF Society, a past Worldcon chair, and did invaluable work in archiving the history and publications of fandom, died from a pulmonary embolism on 9 May. He was 65. I'll miss Bruce's staunch support for the fan funds, and his endless punning 'Tripe Report' postcards, sent from countless exotic places as he travelled the world on cruise ships with his wife Elayne (to whom all sympathy). Small Press. That new UK sf magazine 3SF launches in October 2002 with Liz Holliday as editor. Subscriptions £20 (BSFA members £18; overseas £25/$45) for 6 bimonthly issues, to Big Engine, PO Box 185, Abingdon, OX14 1GR. Speaking of Big Engine, I'm gloating over page proofs of my very own BE project Maps: The Uncollected John Sladek – 358pp plus 20pp prelims, containing a full 60 Sladek stories, essays, and other rarities, eleven of them co-written with Tom Disch. Jo Fletcher's CompuServe account is no more; correspondents should use her work address at Orion Books. Gwyneth Jones's prestel.co.uk account is also going away. Reading SF Group pub meetings have embarked on the complex wanderings of a 'summer tour', reverting to the Monk's Retreat in Friar Street for the early meeting at 7:30pm on the third Monday each month. Details at www.rsfg.org.uk. Charles Platt promises to lick my boots if I mention his satirical send-up of the Enron debacle: see www.enrobreport.com. 'There is an SF angle to the Enrob Annual Report. A double-page spread in the print version describes the plans of this fictitious organization to capture asteroids, visit Mars, and search for extraterrestrial radio transmissions. It says here: "In our constant quest to invade new markets and dominate them, Enrob searches the skies. This giant communications dish in Sri Lanka scours every waveband ... when we find an alien civilization, we'll be ready to rip off anything of value that they have, forge temporary alliances with their potentates, and export trashy Earth-fabricated baubles at a huge markup." Etc. I like to think that my childhood hero, Murray Leinster, would have approved.' The boots are in the mail, Charles. Locus's website at www.locusmag.com fell victim to its own popularity near the end of May, when the host company shut it down for exceeding an unsuspected bandwidth limit. Your paranoid editor worried that the resulting message 'Forbidden ... You don't have permission to access / on this server' was aimed at him personally. Normal service was restored on 30 May. Ansible 179 Copyright © Dave Langford, 2002. Thanks to Paul Barnett, Ben Henley, Don Herron, Alison Hopkins, Darren Nash, Robert Newman, Bob Rickard, Steven H Silver, Jon Weir, Martin Morse Wooster, and our Hero Distributors: Rog Peyton (Brum Group News), Janice Murray (North America), SCIS, and Alan Stewart (Thyme/Australia). 1 Jun 02.